After shuffling cases of cakes to the delivery van, careful not to spill their precious contents, we had a quick and furious snowball fight still in our aprons, running around and around the bare trees like hopeless cartoons. A faceful of snow, and then we were whistled back indoors so as not to shock the few customers that might have braved the chill for an early croissant on a Sunday morning. It was childish and exhilarating. Later, on a train bound for equally snowy London I found myself cursing the weather – in the way of a precious two days at home. Keeping me company as we crawled through the tunnel was a book – a memoir with food – called ‘Risotto with Nettles.’ The stories of pre-war Milan, of tough Italian women rolling metre-wide stretches of homemade pasta and an angry army officer searching bags only to confiscate freshly made salami distracted me from the delay, left me dreaming. 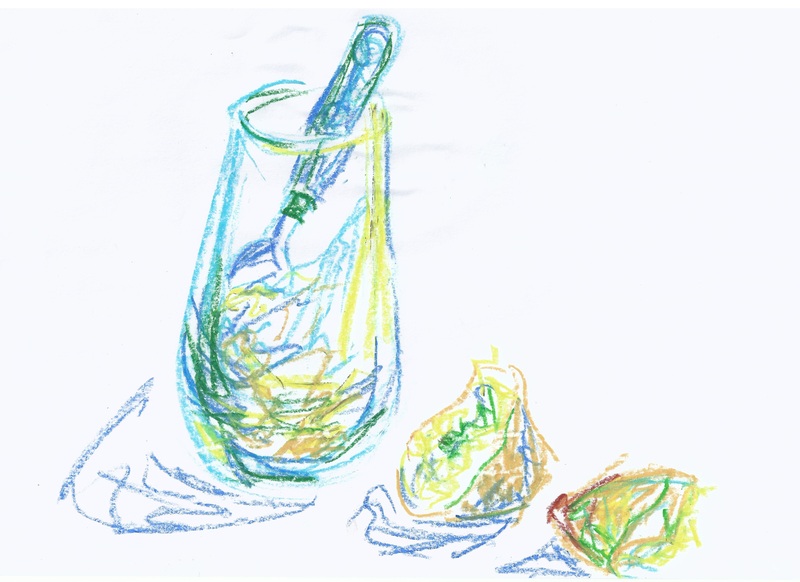 One of the nicest images in Anna del Conte’s childhood is of running up to the attic overlooking the city and scooping snow into a large glass for an improvised lemon granita, simply mixed with lemon juice and sugar. Waking up to still-white England the next morning, I snuck outside in my pyjamas to make my own version. I used a whole lemon because I love the bitter twist and added a touch of maple syrup, in a nod to the Canadian maple syrup candy poured when boiling-hot onto the deep snow. Back inside, in the warmth, it was fresh and sharp and satisfying, a winter lemonade. Squeeze half the lemon into a large glass and mix with 2 tsp maple syrup. Fill the glass with fresh clean snow, stir vigorously and top with more juice and syrup. Stir again, taste and adjust flavouring accordingly. Eat straightaway.